The equipments require are gloves, tourniquet, tape, cotton wool balls, sterile wipe, gauze, needle, syringe, collection bottles. The patient should be informed regarding the risks associated with venepuncture such as accidental puncture of the artery, infection, bleeding and hematoma. Patient should be sit comfortably with the arm placed on the pillow. The tourniquet is applied. Identify the sites of the vein. The most common site is at the antecubital fossa of the upper limb. The limb may be warm to make it easy to find the vein. The vein will be visible. However, venepuncture should be avoided in certain sites such as cellulitis area, edematous area, scarred area, on the limb on the side of previous axillary clearance and mastectomy, area of hematoma, thrombophlebitis, phlebitis and limbs where infusion is running. Non dominant thumb i used to pull the skin over the vein. The needle is inserted bevel up at an angel of 30 degree until a flashback is seen within the hub of the needle. Patient may experience sharp scratch. 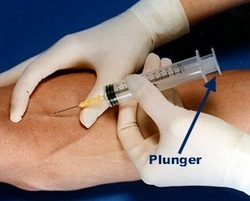 The plunger is then withdraw slowly until the required amount of blood is obtained. The needle is removed the cotton wool gauze or plaster is secured at the puncture sites. The vacuum collection bottles are later filled by using the needle to puncture the rubber tap of the vacuum collection bottles for the blood to enter the tubes. The tubes are labelled on the patient’s bedsides.